Currently a staff writer for The Word Among Us. For the past twenty years, her articles on prayer and the Scriptural life, reflections on Scripture, poetry, and Bible study materials have appeared in many Catholic periodicals including The Word Among Us magazine, New Covenant, Faith and Renewal, and God's Word Today. She is the author of a number of books including My Soul Magnifies the Lord: A Scriptural Journey with Mary and God to the Rescue (Exodus): A Guided Discovery for Groups and Individuals (Loyola Press, 2002). In her spare time, Jeanne enjoys the sport of archery and currently resides in Ann Arbor, Michigan. 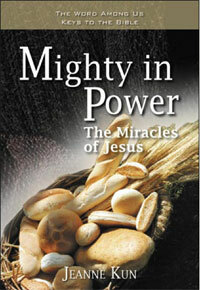 Mighty in power, Jesus confronted sickness and sin—even death—with the sovereign authority that was his as the Son of God. 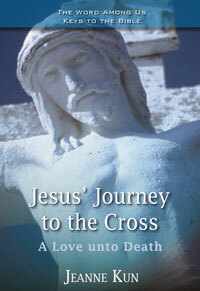 His miracles were signs that communicated his Fatherss love and compassion and drew men and women to faith in him. 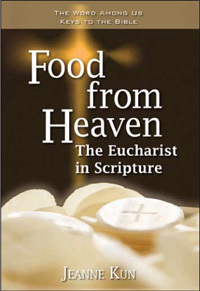 The third in the popular Keys to the Bible series from The Word Among Us, Food from Heaven will help readers navigate through the Bible to understand and appreciatethe foundation of eucharistic worship. 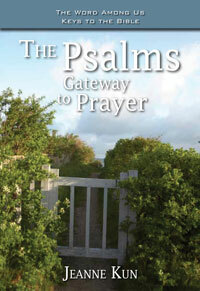 For nearly three thousand years, men and women from diverse lands and cultures have been lifting their hearts to God by praying and singing the psalms. In this newest Bible study in The Word Among Us Keys to the Bible series, popular author Jeanne Kun shows us why these beautiful and timeless songs have such a universal appeal. We have all faced times of crisis. 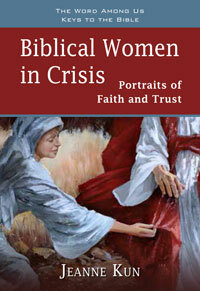 In this bible study, women from the Old and New Testament show us how to respond with faith and trust in the Lord when we are caught up in difficult, surprising, or uncertain situations.